an education project which coincides with the Muslim festival of EID-Ul-Fitr. The festival is being celebrated this weekend to mark the end of Ramadan, a holy month of fasting. 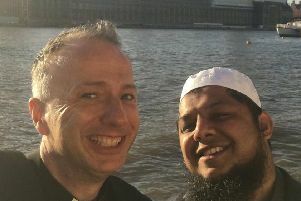 The Kirklees Faith Network has invited Aaqib Zahoor to stand in a special photoshoot for an exhibition looking at the theme of the former British-Indian Army’s involvement in the Second World War. The exhibition is part of the network’s ongoing efforts to educate youngsters on the topics of community cohesion and postive social relations. Mr Zahoor said: “EID-Ul-Fitr is not just about celebrating a festival with food and new clothes. “Its also about bringing neighbours together from different cultures. The exhibition is due to take place in various praimry and secondary schools from September. The British-Indian Army was the largest volunteer force, made up of Muslim and Sikh soldiers from the Indian Sub-Continent who fought for Britain during the Second World War. The vast majority of young men who voluntarily signed up to join the British-Indian Army came from the villages of three main provinces. These were the Punjab, Kashmir and North-West Frontier regions of what was then known as the country of British-India. Mr Zahoor said: “I feel proud to stand in this photo-shoot for such an important exhibition.